I’m an Apple fan. Nowadays this is not a shameful thing. Before and especially after the tragic death of founder Steve Jobs, people are treating like a big celebrity, with even his biography becoming an object of cult (see also With Steve Jobs book in hand, fans angle to impress). Bloomberg published a special issue of its Businessweek magazine solely dedicated to Mr. Jobs. When I was a kid, this would have been unthinkable. I grew up surrounded by Macs. I remember playing around on my dad’s Macintosh, with a 80 MB hard drive and a 15-inch monitor. I also remember that I tried to convince our neighbors to also purchase a Mac as their first computer. They went for a Windows machine. That was around 1995. During the subsequent years I was edged towards buying a Windows myself, despite my devotion towards Apple, for multiple reasons. First, there weren’t any games, at least not the new ones. I remember I had to wait for nearly a year until I could get hold of Civilization II; Command & Conquer Red Alert was never released, I reckon. 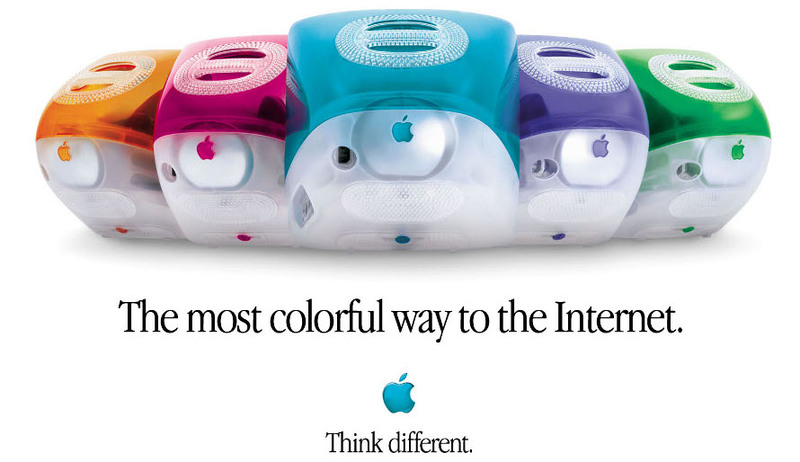 In 1998, I was around 13, I received the nickname ‘Mac’, since I was more or less the only one in the entire school to use an Apple computer. For some reason, however, I didn’t feel like switching, and I always promoted Apple and tried to convince my friends to abandon the evil guys (Microsoft). It was also when I started reading MacUp, a German magazine about Apple computers. My parents supported my aspirations in informatics and provided me with a PowerMac 7600 (I think it had like a 167MHz processor, 16MB RAM and a 1GB hard drive), which soon needed an upgrade. It was a time where there were many third-party hardware options, and even Mac clones (like the ones from Gravis, or this X-Cube), which were often better priced and better performing than Apple’s hardware. When Mr. Jobs returned to Apple, the clones disappeared and soon the iMac came out, a turning point in the history of fruits. My school bought a few Macs. Education, at least here in Switzerland, probably was one of the last industries where Apple was still seen as a friend. Most companies were pure Windows shops (and probably still are). Although the iMac looked weird, it was an object that people bought because it was really easy to use. I guess many families with little expertise in IT struggled at getting to work a Windows machine with a third-party modem and a fourth-party internet provider. You had to enter all these numbers and the connection often dropped. Apple’s iMac made this all easier. With it, games started coming back to the Mac. The iMac came with this free game called ‘Nanosaur’, one of the first 3D games on an Apple machine. It was actually quite cool. Apple’s problem soon became that its hardware was below market benchmarks. A new product would be good, but quickly became antiquated because of too long product cycles. The PowerMacs G3 were nice but were overrun by better processors made by Intel. Apple processors traditionally were manufactured by Motorola, who brought out its G4 in the early 2000s. The G4 was a solid processor and found its ways into the music studio, where I was learning about synthesizers. To my 18th birthday, I received a brand new PowerBook G4, the first Apple that hadn’t been used before (my previous notebook was a colorful iBook, which didn’t even have the power to play a DivX movie). Yet, the long product cycles prevailed. Apple, probably it was Mr. Jobs, soon decided to abandon Motorola and to go with IBM, who developed the G5, a slimmed version of its server processor. Although Apple’s products, especially the PowerMacs G4 and G5, where pretty good machines, they were just too expensive for the normal buyer. With prices starting at $2500, it was not an affordable computer. Graphics designers and musicians, however, who were actually earning money with processing power, were very happy with these expensive but powerful models. I think what Apple saw was that its notebooks were highly appreciated, despite their horrendously high price. People were obviously willing to spend more money on a nice notebook than on a PC tower. A notebook was an object that you might bring to work, might use in a public spot or even during an important meeting. So being slim, shiny while offering state-of-the-art technology, was worth a premium. Apple probably also realized that its new OS X system, after a few rounds of bug fixing (I think the first really usable system was 10.2 Jaguar), was attracting more people than its hardware. Because the company realized that its competitive advantage doesn’t lie in creating nice processors and cool motherboards, it did the previously unthinkable move of teaming up with Intel. Apple didn’t want to lose out just because its chips supplier couldn’t catch up with standards. So more energy could go into software and its mobile devices. What happened then is probably known to everybody: iPod, iPhone and iPad. At least now I can publicly tell my story without being called ‘Mac’. Although this nickname, in today’s world, would probably make me a celebrity, or at least a fashionable guy.